We are in the desert. You can see far and see … nothing. The camera pans to the side until it captures a cactus. How exciting. Minutes pass. The wind whirls up a few grains of sand that gather to form a cloud of dust. Suddenly a bale of straw. It rolls through the picture as if it were dancing. Then silence again. The beetle stands in front of us with its eyes wide open. Kawusch? What was that? Slow pan to the cactus. Cloud of dust. Bales of straw. Bug. Kaa…Kaa. Kaa…wuu…sssssch. Oooooh. Disillusionment. 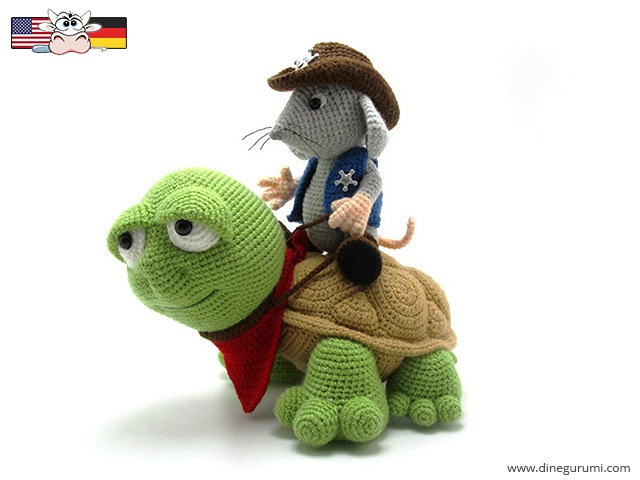 It was only Sheriff mouse on his turtle. You see them here more often. If one can see them. They make sure that everything runs smoothly. The two are always the first at the crime scene. Who knows what’s going on? !